Re-reading the Fantastic Four comics from the start. We’ve time traveled back to the 1930s in issue #292, so let’s fight some Nazis why don’t we? To recap: Reed is dead after a battle with Annihilus. 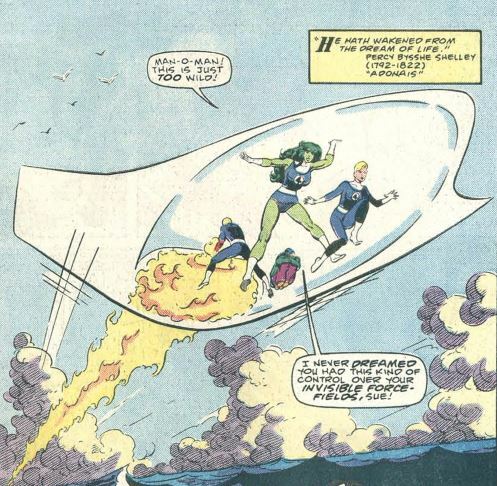 That same battle flung Sue, Johnny, She-Hulk, and special guest star Nick Fury back in time to 1936. 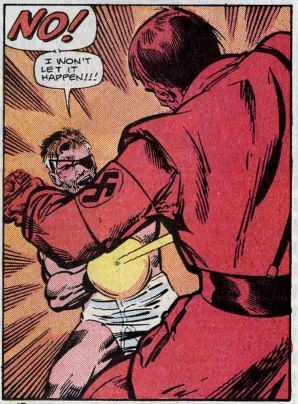 Fury took off to murder Adolph Hitler to prevent the horrors of World War II. Now the FF must stop him in order to preserve the timeline/space-time continuum/butterfly effect, et cetera. We begin with some perhaps-questionable physics in which Sue has created an airplane-shaped invisible force field, while Johnny uses his flame as jet propulsion, so that the team can quickly cross the ocean from NYC to Germany. They’ve also picked up a stray, jazz musician Licorice Calhoun, who claims to have dream-based superpowers. 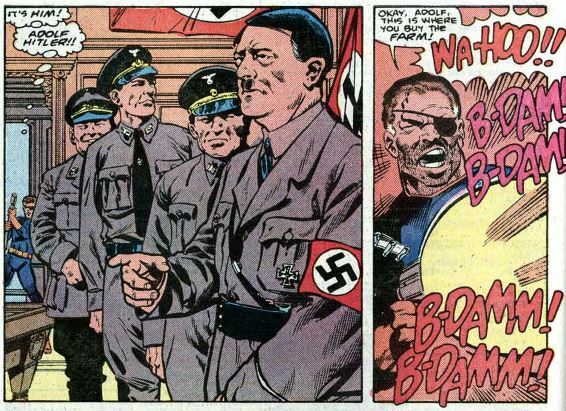 After three pages of recapping the events of previous issues, we catch up with Nick Fury in Germany, who has easily snuck past the guards at Hitler’s gigantic mansion. He rounds a corner and runs right into ol’ Adolph himself. Fury opens fire, but Hitler’s bodyguards fight back, shooting Fury in the chest. The FF arrive at the mansion and they hear the gunfire from outside. (How’d they find it? Fury has a tracking device on him that She-Hulk was somehow able to follow.) There’s a bit where She-Hulk easily destroys a door by barely touching it, showing her powers going haywire. 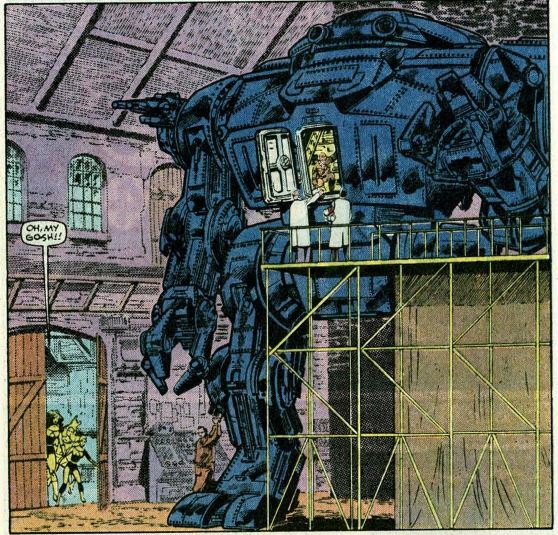 In the mansion, the FF discover not Hitler, but a giant robot! 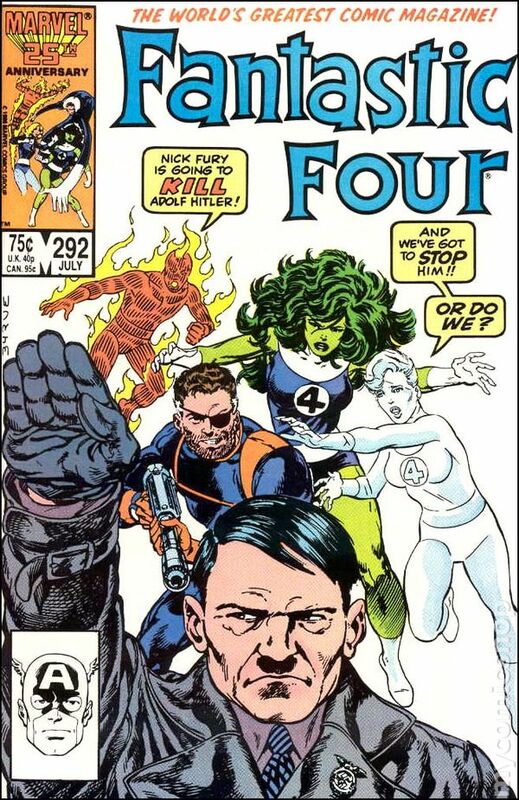 The Nazi scientists power it up, and we get a couple pages of fighting as the FF take it down, including She-Hulk ripping open the bot’s cockpit and taking out its human pilot. Turn the page, and our heroes wake up inside a S.H.I.E.L.D. lab, as a S.H.I.E.L.D. agent says “Espers, break contact.” What’s more, Reed is there, alive and well. In more perhaps-questionable physics, Reed explains that the explosion that destroyed Annihilus flung him into the vacuum of space, where his cells expanded into a spherical shape to keep him alive. That seemingly-random line from issue #290 about the weather balloon? The “weather balloon” was really Reed. Sue is of course glad to see him. Reed then takes everyone to meet Calhoun, now 84 years old, who has been in a coma for 50 years. Reed explains that Calhoun is a mutant, whose dreams do indeed alter reality. S.H.I.E.L.D.’s ESP agents (the “espers”) have had him under watch for some time. The FF and Fury weren’t flung back in time, they were flung into Calhoun’s dream world. Fury killing Hitler provided the mental shock needed to jolt everyone back to the real world. Johnny speaks for the audience, upset about the whole “it was all a dream” thing, but Sue, happy that everything’s back to normal, insists on calling it a day. Unstable molecule: Reed’s return from the dead is played with as little drama as his “death” two issues back. Really, it was just an excuse to get him out of the way so the other three could have a time travel adventure without the benefit of his science genius. 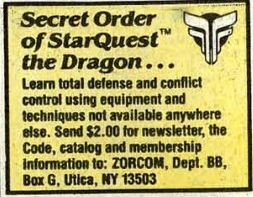 Fade out: Sue says the force-field-as-airplane is something she had Reed had been experimenting with for a while. Flame on: Despite being alongside his teammates this whole issue, Johnny does almost nothing but provide exposition during the recap and a make few hokey jokes. Fantastic fifth wheel: This issue has a few mentions of She-Hulk getting stronger, with her saying she’s almost as strong as the Hulk. Is this because they’re in a dream world, or were they trying to set her up as one of Marvel’s heaviest hitters? Commercial break: What, exactly, is this an ad for? 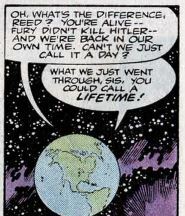 Trivia time: While discussing those lost in World War II, Nick Fury mentions Pam Hawley and Junior Jupiter. Jupiter was the only one of the Howling Commandoes to die in battle, and the first Marvel character to permanently die. Hawley was an English medic who once romanced Fury, only to die in an air raid. The Marvel wiki informs me that Calhoun never appeared again after this. I wonder why no other writer ever used his dream-universe for other stories. This issue never mentions the fact that the original Hate-Monger was secretly a still-alive Hitler, but because it’s all in Calhoun’s head, there’s no way Calhoun would have known that. Fantastic of frightful: The cop-out ending means this has been less of a story and more of a here’s-a-bunch-of-stuff-that-happened. We do get She-Hulk trashing a giant robot, though, so that’s something. Next week: Bye, bye, Byrne.